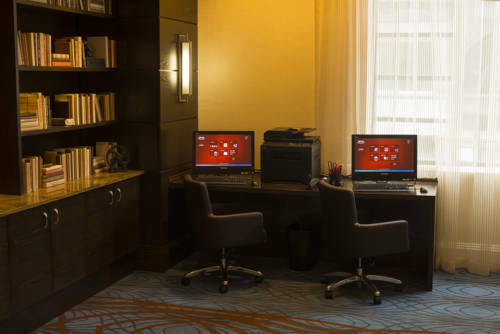 Transform your visit into a brilliant travel experience when staying at Milwaukee Marriott Downtown. Living up to our name, you'll be right in the heart of East Town, downtown's thriving district brimming with shopping, dining and entertainment. Business professionals are within walking distance to attend conferences, conventions and networking events at Wisconsin Center. Following a busy day of work or sightseeing, treat yourself to elevated comfort food and locally-loved craft beer and cocktails at East Town Kitchen & Bar, our on-site restaurant open for breakfast, lunch, dinner and weekend brunch. Retreat to relaxation in our stylish rooms. High-powered meetings or elegant celebrations can be successfully hosted in one of our six flexible event spaces. In-between events, start a vigorous workout at our fitness center, then soothe your senses in our indoor pool. Whether visiting for business or leisure, let Milwaukee Marriott Downtown be a part of your travel journey. Starbucks : Start your day off right when you stop by Starbucks and pick up a signature cup of joe. It's the perfect jump-start to a busy day of conducting business or exploring downtown Milwaukee. East Town Kitchen + Bar: Our name says it all. From our artisan meat and cheese boards to local craft beers, experience the best of what Milwaukee, Wisconsin is known for. On Monday through Friday, our restaurant offers happy hour from 3:00 p.m. to 6:00 p.m.